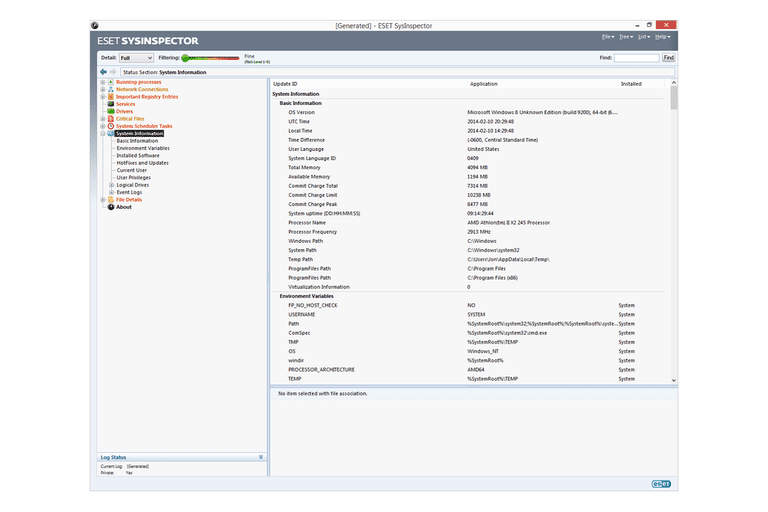 ESET SysInspector is a portable, free system information tool that details possible security threats found in running processes and services, drivers, and active network connections. Because there's both a 32-bit and 64-bit version of ESET SysInspector, you must choose the correct one for your version of Windows. See Am I Running a 32-bit or 64-bit Version of Windows? to learn more. This review is of ESET SysInspector version 1.3.5.0. Please let me know if there's a newer version I need to review. ESET produces security-focused software, and SysInspector isn't too dissimilar. Instead of showing exhaustive detail on hardware like other system information tools, it instead identifies software components that could pose a threat to your computer. Basic OS information and all-inclusive detail on things like running processes, drivers, and services are the ​center of focus. ESET SysInspector works with Windows 10, Windows 8, Windows 7, Windows Vista, Windows XP, and Windows 2000. Also supported is Windows Home Server and Windows Server 2012, 2008, and 2003. See the What ESET SysInspector Identifies section at the bottom of this review for all the details on the hardware and operating system information you can expect to learn about your computer using ESET SysInspector. As I already mentioned, ESET SysInspector is a bit different than other system information programs but that's part of what makes it a good tool. ESET SysInspector is definitely not as detailed as most other system information tools in that it doesn't show detailed information on the motherboard, RAM, CPU, etc. However, it's certainly useful in what it does show, such as the detailed information on drivers and network connections. There's a handy feature that makes it easy to filter through processes to find ones that could potentially be dangerous. You can adjust a Risk Level filter, which is used to display running processes that are identified as anything from Fine to Unknown or Risky. This is the only system information tool I've found that can do this, which definitely sets it apart from the rest. Something else I like about ESET SysInspector is the ability to create service scripts. This means an advanced user can remove threats from the computer by first examining a log file of the computer, then modifying a script to automatically remove the threat when the script is loaded. Because common details that are found in most other system information software isn't included in ESET SysInspector, I wouldn't make it a first pick when choosing a good program for finding hardware information.